ComboTree is a ComboBox with a drop-down tree. It can be used as a form field that can be posted to remote server. In this tutorial we will create a register form that has name,address,city fields. 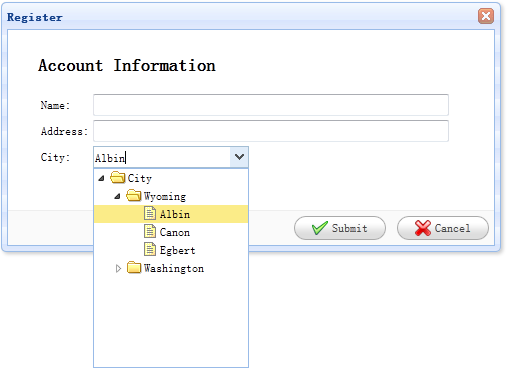 The city field is a combotree field in which user can drop down a tree panel and select a specified city. See the code above, we set a url attribute for the combotree field named 'city', with which the field can retrieve tree data from remote server. Notice that the field has a class named 'easyui-combotree', so we don't need to write any js code, the combotree field will be rendered automatically.